There’s a new product on the market, and this fall, it was hard to miss. 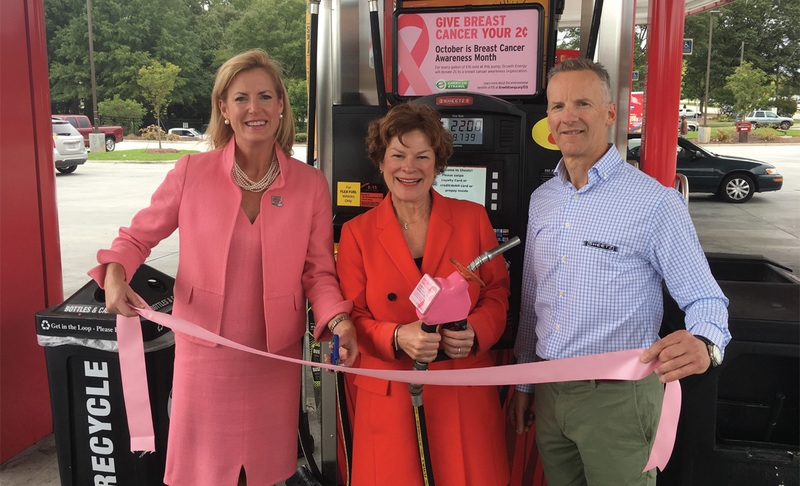 Over the past couple years, Growth Energy has spent a lot of time building a new marketplace for E15, and this October, they launched the Pink Out program, a campaign that not only would build consumer awareness but would raise money for local charities. And it has been quite the season of success. E15 is a higher octane fuel that is approved for all vehicles 2001 or newer. That’s 86% of vehicles on the road today, says Mike O’Brien, Growth Energy’s Vice President of Market Development. So Growth Energy got to work. Before they launched the Pink Out program, O’Brien says they began with infrastructure. And it was a big effort. Much of this work was made possible by Prime the Pump, a nonprofit which works to pool industry resources for the advancement of E15 and higher ethanol blends. The Pink Out program was a great place to start. Participating retailers included Minnoco, Sheetz, Protec and Murphy USA, placing E15 at 720 dispensers across Minnesota, North Carolina, Iowa, Illinois, Arkansas and Florida. When they considered the market, they looked to women, their key consumer target. O’Brien says Pink Out is also a nice kickoff to more joint marketing programs in the future. This is only the beginning of an already successful promotion for E15. WHAT IS THE PINK OUT PROGRAM? 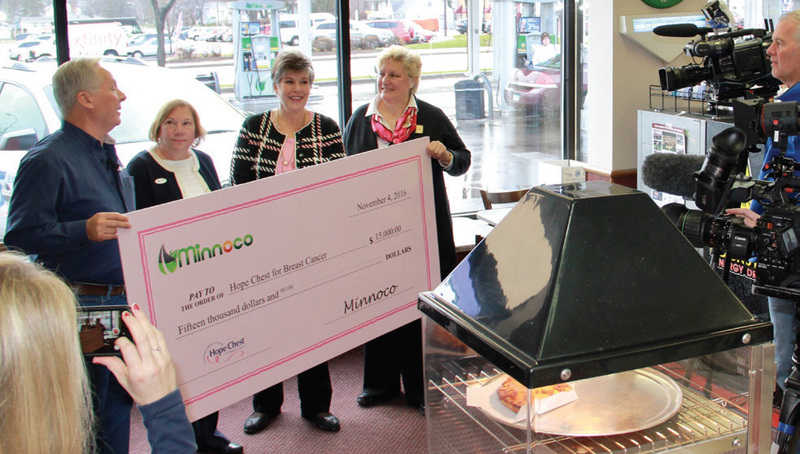 The Pink Out program originally began in 2015 as a fundraising initiative for Minnesota retailer Minnoco. 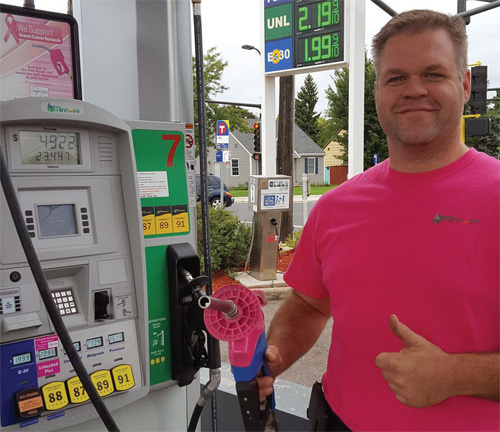 They had some customers struggling with breast cancer and wanted to do something special for October’s Breast Cancer Awareness Month that also helped to promote E15. It was incredibly successful for their communities. Growth Energy noticed. O’Brien says they were so pleased with Minnoco’s campaign that the Board of Directors volunteered their support, and they decided to roll it out nationally this year. And O’Brien says POET is the one who plays the strong leadership role in getting E15 off the ground. “POET has been right in the middle of it and very supportive with all the activities we’re trying to execute to build E15 into the marketplace,” he assured. Minnoco has had E15 available at their pumps for three years now, but Klatt says they continue to see a steady increase in interest and in sales. The genuine investment of the retailers has a lot to do with that success. 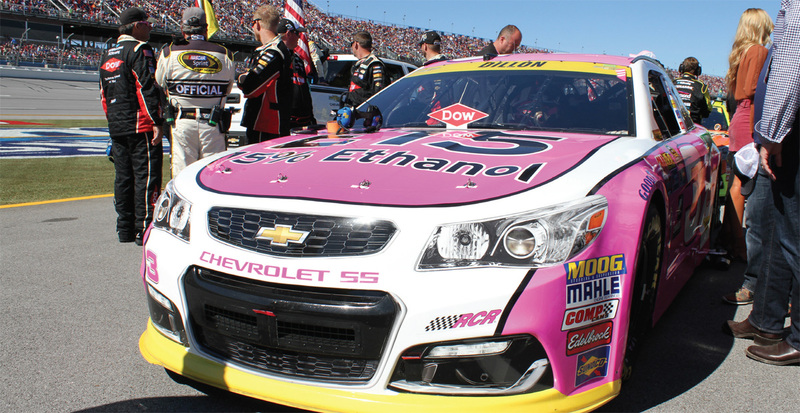 In support of the Pink Out program the #3 American Ethanol Chevrolet had a pink paint out for the October Talladega race. Employees at the Sheetz locations in North Carolina have the same investment. Michael Lorenz is the Vice President of Petroleum Supply for Sheetz, and he says his retailers have to be out there talking to consumers, or they’ll lose a sale. Lorenz says that consumers are merely going through the motions. Grabbing that attention is the responsibility of the retailer, one they have taken on well. Klatt says that once the Pink Out fundraiser ended, his retailers still marketed E15 with great enthusiasm. O’Brien is also grateful to the employees at Sheetz, Minnoco, Protec and Murphy USA. Their energy and respect for their work has made a huge difference in promoting E15. O’Brien also knows the E15 retailers stand out more than others. And, these retailers have immense respect for Growth Energy. Another way he’s tipping his hat? Pumping his own vehicle with the great E15.